This breed of dogs is a lively, good natured and ever ready to please, hailing from Germany, it belongs to the Spitz clan. Its light on its feet, yet strong and has a natural glow in its appearance, also being small to medium in size, rather well balanced and just right. It has also found fame in the circus arena, being acclaimed as the 1st dog to walk the tightrope, thus becoming very popular, especially with children. 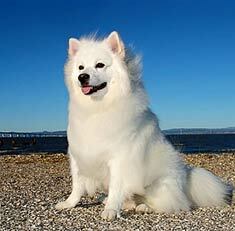 Eskimo's are also affectionately referred to as "Eskie". Basically Eskimo's rejoice at being surrounded by family, espically older children, or even children they have seen since they were puppies. They make excellent companions and even better guard dogs and are known very alert and cautious of strangers and know how to safe guard their home and mark their territory.Friendly they are with pets of their own size or even larger, however, they will boss any pet smaller than them. If left to themselves for too long, they get bored and start barking with the extent of being destructive. Eskie's have the tendency to increase the poundage, so they should maintain a healthy diet with regular excercise. They are also prone to some dog diseases like patella luxation, PRA and hip dysplasia. Their coat should be brushed 4 times a week to keep it from getting knotted and bathe when required.